Have you seen this sweet little daisy? I stitched it up for Spring Fling on Sunshine and Carousels, which is where you'll find the pattern. 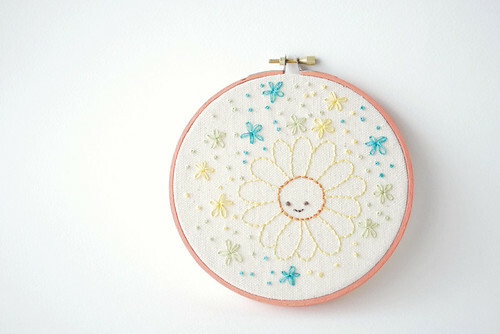 It was lots of fun because only the large daisy is part of the pattern. The rest is all improvisational embroidery. Is that a real thing? I'll say it is. It's adorable!!! Funny, I was shopping for embroidery floss at Joanns in St. Charles the other day and had to think about you and the post you wrote about all the different kinds there are...very inspirational! It's adorable! I love how happy the flower looks. It's the perfect thing for spring. Would it be ok with you if I shared this pattern with my Daisy Girl Scout troop? Super cute!!! Thanks!!! I love everything about it: design, colors, stitching!!! Eva: Please feel free to share this with your group! Love this lil guy!! :) He's so happy! This is beautiful! Well done! So cute! I stitched up the daisy last night!